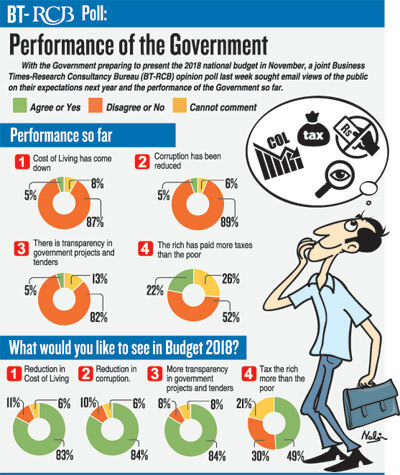 Sri Lankans see little or no improvement in their living standards, the level of corruption or transparency, according to an email poll conducted recently by the Business Times. This was one of two opinion polls jointly conducted by the Business Times and Research Consultancy Bureau (BT-RCB) last week. While the results of the street poll undertaken by RCB were published last week, the result of the email poll, held up due to a shortage of space, is released today. On the first set of email questions, as to the performance so far in 2017; 87 per cent of the respondents said the cost of living hasn’t reduced, 89 per cent said corruption hasn’t reduced, 82.5 per cent wanted more transparency in government projects and tenders and 52.4 per cent disagreed with the view that the rich had paid more taxes than the poor. The second set of questions pertained to expectations in the 2018 budget. Here, 82 per cent said they wanted a reduction in the cost of living, 84 per cent urged a reduction in corruption, 84 per cent wanted more transparency in state projects and tenders and 49 per cent said they would like to see more taxes for the rich and less for the poor. Among the comments received in the poll, respondents said top government politicos continue to be involved in corruption while officials are often guilty of ‘”tender bending”. It was pointed out that the lethargic Inland Revenue Department go only after people who already have tax files, to reach their targets. This department’s performance should be tested by the number of new files they open and new revenue brought in by each assessor. RCB’s street poll, the results of which were published last week, was conducted in Colombo and Galle with both cities often providing differing views and opinions. The poll was conducted among a total of 600 respondents from both areas. People were asked to respond with “increased”, “decreased” or “no difference”. This time too there were mixed views from both cities to the poll. 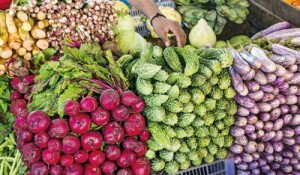 On the first question as to whether the cost of living (COL) situation has improved from last year, 62 per cent of the Galle respondents said the COL has increased while 71 per cent in Colombo also agreed with the “increased’ response. Taken together, 67 per cent of the total of 600 respondents from both cities said COL had increased from last year. On the status of corruption compared to last year, 45 per cent of respondents in Galle said it had increased with 38 per cent saying there was no difference. Colombo residents viewed it differently with 57 per cent saying there was ‘no difference’ from last year. The overall percentage? 47 per cent saying there was no difference. Has transparency improved from last year? 42 per cent said it had increased while 40 per cent said there was no difference – both from Galle respondents. In Colombo, 54 per cent of the respondents said there was ‘no difference” from last year while 24 per cent said it had decreased. In the overall percentages, “no difference” got 47 per cent of the vote. On whether the rich has paid more taxes than the poor this year, 46 per cent of the Galle respondents agreed that the rich had paid more taxes. In Colombo, the ‘no difference’ vote got 49 per cent while 33 per cent said it had decreased. Overall percentage showed 45 per cent saying there is “no difference”. Many comments were made during the street poll in Colombo and Galle. Given below is a cross section of the views. While every item has appreciated in the past two years inflation that stood at a single digit has appreciated by 12 – 14 per cent. You can visualise the cost of living when you look at items like fuel and rice. The crisis has aggravated with the increase in lending rates. The poor people have virtually become beggars. You need at least around 5,000 rupees per day to manage costs. 1000 rupees has depreciated so much that its value today is 100 rupees. There appears be a reduction of bribery and corruption. However what is also happening is that only the sprats are caught while the big fish escape. Corruption has remained over the ages. That will never change. Bribery? Some accept money in broad daylight. There is lot of corruption in contracts pertaining to highways. RDA tenders are questionable since the recent awards have gone to companies who were rejected. As per the Treasury bond issue, it appears that all are connected including the Prime Minister and the ministers. Major projects get tax concessions while taxes on the common man are imposed at their own discretion. The common man is mostly affected by taxes on basic essential goods. There is no national plan for anything in Sri Lanka. That is why the politicians have neglected the people and continue to rob the nation. The Government is tacitly encouraging corruption and pretends to reduce it. There is no difference between this regime and the former regime. The Treasury bond case is treated as if it’s a small issue and irrelevant. People are burdened by paying for the perks enjoyed by the MPs. The cost of living has gone up and is unbearable. The US dollar is now 150 rupees. Tenders are offered to known parties who give commissions in return for the favour. Nothing happens without commissions in the procurement industry. The culture is the same as in the past. Yes, the rich and famous are taxed. But after that, they rob the funds belonging to the state and the people. This Government has no policy. They talk about laws and the enforcement of the law. But they have not achieved even half of what (former President) Mahinda has done. Violence has ceased but corruption continues. The ones who are corrupt are in power. The big fish like Basil are out. Ranil’s economic plans are outdated. You need more practical solutions to resolve economic issues. Only a few genuine ministers are working in this Government. Others mark time to destabilize the state. Mahinda’s disciples still haunt the system. They and some top entrepreneurs will obstruct the important reforms needed to improve the nation. Mahinda and Ranil are combining their personal interests and the net result is the economy in tatters. Today the people have fallen from the pan to the fire. Most people are doing two jobs to survive. Nobody thinks about the country, anymore. The national pride is only printed on the T’ shirt and on advertising boards. No one is patriotic. Top people pay taxes but align with ministers and get exemptions and relief, resulting in the small man not getting any concessions. Most people avoid the responsibility of tackling the cost of living and raise unnecessary issues. SAITM is one such issue. The poor man, unfortunately, suffers. Yahapalanaya has no spine or any forthcoming solution to any problem. What is visible is only corruption and a lack of commitment. The tender system is drowned by commissions. There are new ways to resort to corruption and bribery unlike in the past. It is more difficult now to catch the culprits.